I can't believe I managed to get this card done all in one day. So happy!! I purchased this digital stamp from Elizabeth Bell a few days ago. I just love it!! So fun to color!! Used my copic markers for coloring. I added some white highlights with a prismacolor premier pencil. Don't know if you can tell, but there are also tiny dots on her head scarf also done with the prismacolor pencil. My designer papers are old ones from a stampin up simply scrappin kit. I embellished with some black gingham ribbon, paper flowers and flatback pearls. And then I added a little bit of stickles to the designer paper and flowers for some fun sparkles. I made this card for a few challenges, first the sketch is from Sketch Saturday. Dutch Dare's challenge is summer in winter. I think my card is pretty summery. Totally paper crafts has a recipe: 3 embellishments, 2 papers, 1 image. My embellishments are flowers, ribbon, pearls. I know there is glitter on the card too, but I seriously don't count glitter as an embellishment. The card also fits this week's Creative Belli Challenge which is Ribbon. Ok, that's it for today. Hope you liked today's card. Be sure to check back tomorrow for my Digital Tuesday Challenge Design Team card. omgosh Ellie, she's lovely!!! gorgeous card hun and so beautifully colored!!! 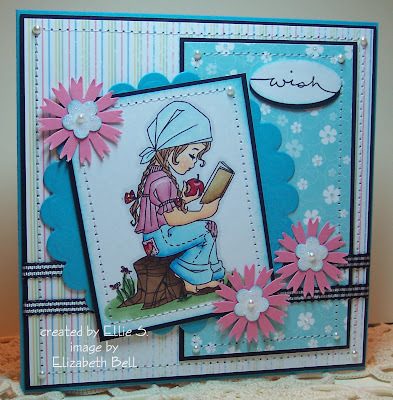 Hey the Creative Belli challenge is to use ribbon, if you want to enter this beauty!!! now I'm off to check out EB digis! What a lovely card. The digital stamp is so sweet! Oh Ellie this is just so beautiful those colours/papers are fabulous and love the little pearls. I got this image as well a few days ago got as far as printing it off but haven't done anything with it yet but you have done an ace job. so sorry for the delay in commenting,just found you in the comments box.